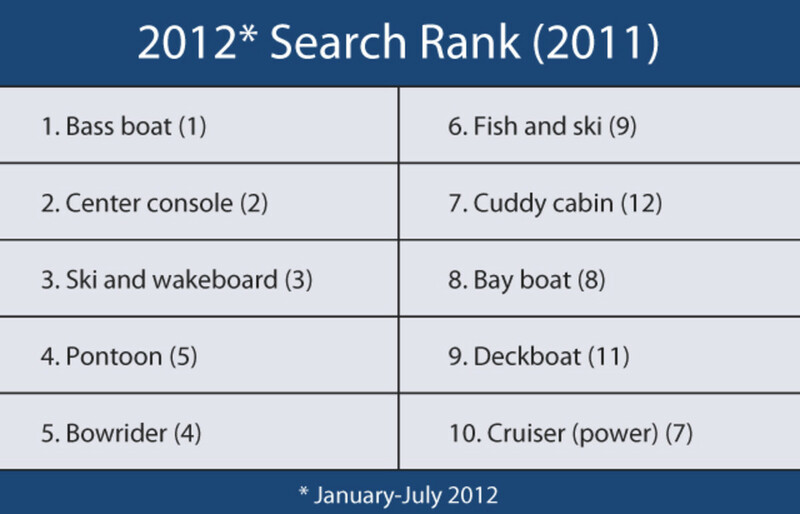 What are the most popular types of boats searched for on the Internet? On BoatTrader.com, where the majority of listings are for used boats, we watch the trends and recently compared searches made in 2012 through July against all of 2011 and found a few notable changes. Bass boats, center consoles, and ski and wakeboard boats led the way during both time periods, but pontoon boats displaced bowriders in fourth place through seven months of 2012. Also moving up the rankings were three multipurpose types — fish-and-ski, cuddy cabin and deckboats. Losing popularity were cruisers, high-performance and jetboats, the latter two falling out of the top 10 from sixth to 11th and 10th to 12th, respectively. We should note that we have not included PWC in this ranking. Along with power and sail, PWC is a higher-level choice — along with powerboats and sailboats — within most search forms on Boat Trader; as such, it is more commonly selected in searches than any of the other boat types.